The saying “you are what you eat” is becoming more relevant with every passing year as India inches its way to becoming the heart disease capital of the world. While non-modifiable risks (age, gender, race and heredity) for heart disease play an important role in determining whether a person will fall into the trap or not, modifiable risk factors (excess weight, abdominal obesity, high LDL cholesterol, high triglycerides, high blood pressure, low HDL cholesterol, diabetes, stress and smoking) have attained significant importance because of the drastic increase in the number of people with coronary artery disease and the decreasing age at which people are falling prey to this killer disease. Food that we eat can directly affect many of the changeable risk factors. Fortunately, correcting the dietary habits of ‘at risk’ persons, will help control most of the modifiable risk factors. This not only reduces the disease-burden but also the economic burden on the person. In excess, they contribute to overweight, abdominal obesity (paunch), high cholesterol, high triglycerides and diabetes. Saturated fats and Trans fats increase LDL cholesterol (bad cholesterol) levels. Trans fats can also decrease HDL cholesterol (good cholesterol). Fried food and high-fat food are responsible for many of the cardiac risk factors. All non-vegetarian items, eggs and dairy foods contain cholesterol, though in different quantities. If your body is unable to process high intake of food cholesterol, it can lead to an imbalance in your blood cholesterol levels. 3) Sugars - especially refined sugar - in excess, sweets and desserts are among the causes of excess weight and high triglycerides. Foods that are high in added sodium (salt, MSG, baking soda) increase the chances of hypertension, particularly in salt-sensitive persons. Though there’s no conclusive evidence on caffeine’s effect on heart disease, large amounts of caffeine might increase blood pressure. In excess, alcohol can increase triglycerides and blood pressure. 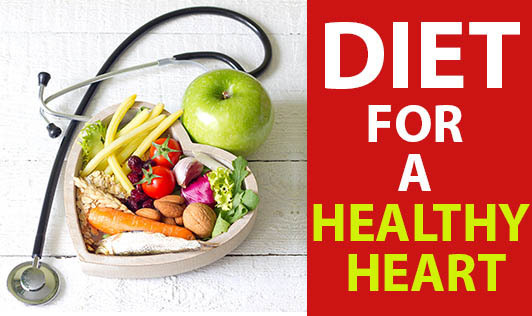 Fruits and vegetables with fiber, antioxidants and micronutrients have a tremendous preventive and therapeutic effect on coronary artery disease. Omega 3 fats, oily fish (salmon, mackerel etc) flaxseed and walnuts are good sources too. Foods rich in MUFA (mono unsaturated fatty acids) have been found to be heart friendly. Almonds, hazelnuts, cashew, olives, peanuts, sesame seeds, avocado, sun flower seeds, nut and seed butters are good food sources.